Description of "Select Translations of Rabindranath Tagore: Volume I"
This book titled Select Translations of Rabindranath Tagore: Vol. I contains five of the best short stories written by Rabindranath Tagore and a play all translated into American English. It was featured on Pothi.com for a fortnight from Mon 20 May 2013 to Mon 03 Jun 2013. This is also the standard edition of the book. A LARGE PRINT EDITION of this book for readers with partial visual impairment is available at http://pothi.com/pothi/node/178260. Bengaluru, Monday 20 May 2013: Starting today, India's biggest self-publishing and print-on-demand portal Pothi.com owned and operated by Bengaluru-based Mudranik Technologies Pvt. 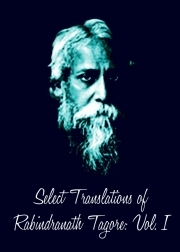 Ltd. is featuring A. Datta's paperback title, Select Translations of Rabindranath Tagore: Volume I on its homepage. The volume contains five short stories and a play all of which were translated into American English by Datta in 2012. Satyajit Ray had cinematically adapted two of the Bengali sources of these translations, viz. Finally and Missing My Bejeweled. The other three stories in this anthology are Haimanti: Of Autumn, One Night and Clouds and Sunshine whereas the play titled The Crown is a translation of Tagore's Mukut. A. Datta who started writing for The Statesman as a school-goer in the early 1990s has released the first volume of this series to commemorate the passage of 100 years since when the then 52-year-old Rabindranath Tagore took the Literature Nobel outside the European continent for the first time since its inception in 1901. One Night is a translation of the short story Ekratri and Clouds and Sunshine is Datta's translation of Megh O Roudra. In the year 1969, famed actress, director and writer Arundhati Devi who had grown up in Tagore's Santiniketan had made a Bengali film based on Tagore's Megh O Roudra with Manna Dey in charge of the music department. However, the six translations comprising the book Select Translations of Rabindranath Tagore: Volume I are not just based on their sources but are faithful to Tagore's original works. Volume II of this book is not expected to be available until late 2015. One of the sections of that volume is likely to be an English translation of Tagore's Europe-Pravasir Patra which has been already completed and is already available as an eBook with Amazon Kindle and Apple's iBookstore. In fact all six translations of volume I first made their appearance as eBooks. In 2013—exactly 100 years after Tagore became the first non-white to win the Nobel Prize for literature—they were compiled and four editions were brought out carrying the exact same content. While two of these are standard editions, the other two are large print editions for visually impaired readers and are priced at par with the standard editions despite greater printing cost due to the very large fonts used—the body text being in 18pt Tahoma. There are two standard editions and two large print editions to enable buyers to pay in their preferred currency or buy from their preferred website and printer. The standard US edition is on Amazon and is also available directly from http://createspace.com/4145425 and the large print US edition is likewise available from Amazon or directly from http://createspace.com/4180965 and one can pay for them in US$. The standard Indian edition can be directly purchased from this web page by clicking the Buy button above. The permalink to this page is http://pothi.com/pothi/node/177595 . Likewise the large print Indian edition can be purchased from http://pothi.com/pothi/node/178260. One can pay in Indian currency for both the Indian editions and there are online as well as offline payment options the latter including payment by crossed cheque. Rabindranath Tagore (1861-1941) was more than a storyteller, mystic poet, composer, playwright and philosopher all rolled into one. In each and every one of these capacities he had excelled as few mortals have managed to. He was also a celebrated artist, a successful estate manager and more than a bit of a practical psychologist. Born into a wealthy and enlightened family, Tagore received the kind of nurture one of his talented disposition needed. Nevertheless, as a kid, this king of purple prose had difficulty convincing a few of his teachers that he indeed was the true author of some of his writings. And even though he dropped out of school, he would one wintry day in 1913 become the first non-European as well as the first non-white to win the Nobel Prize for literature and would later go on to found the Visva-Bharati University where scholars from all parts of the world throng today to study his worthy legacy. In 1919, Tagore would also just four years after being knighted repudiate that title to protest the massacre of Jallianwala Bagh, a decision which elevated him even more in esteem before the whole world and served to lay bare the tyranny of the Raj. In 1940, the University of Oxford would hold a special convocation at Santiniketan, the seat of Visva Bharati in India to confer its Doctorate on Rabindranath Tagore. Tagore primarily wrote in his native language of Bengali which is one of India's 22 official languages and the only official language of Bangladesh. It is also spoken by over 250 million people today. His songs include the national anthems of India and Bangladesh, both written in Bengali although India’s lingua franca is Hindi. Tagore's music and poetry are today enjoyed as much as they were in his lifetime and he is a prophetic figure as much in the orient as in the occident. Despite being rich and recognized, Tagore had his share of misfortunes as his mother, his wife and two of his five children died rather early. But he showed remarkable resilience after these losses and the stream of his creativity flowed on till his last days. Volume I of Select Translations of Rabindranath Tagore contains five of his short stories and a play written by him translated into English for your pleasure. Tagore lived and died in an era of chauvinism and his thoughts as reflected in his writings were stunningly unbiased and objective. It is easy to see how powerful his stories are in the act of hollowing out ignorance. And his method of doing so had been sheer magic! Reviews of "Select Translations of Rabindranath Tagore: Volume I"
“It had rained the day before. It was morning time and the pale sunshine and the fragmentary clouds had been taking turns to paint the near-ripe pre-autumnal paddy fields with their goliath paintbrushes. The spread-out canvas was continually changing colors between a bright yellow hue upon receiving direct sunlight, and a pleasant mellow adumbration upon being smeared with the shadows.” This wonderful description of nature’s hide and seek between the clouds and sunshine after a brief shower is directly translated from the prose ‘Megh O Roudra’ by Rabindranath Tagore. The translator is A. Datta and that story is named ‘Clouds and Sunshine’. His book ‘Select Translations of Rabindranath Tagore: Volume I’ consists of five short stories and a play by Tagore. The remaining ones are—Finally (Samapti), Haimanti: of Autumn (Haimanti), One Night (Ekratri), Missing My Bejeweled (Monihara) and the three-act play titled, The Crown (Mukut). The translation is well versed and easy to read, thanks to the lucid writing. Datta has excellently conveyed the subtle beauty and the essence of Tagore’s original work throughout his translation. He writes in the Foreword to this book, “Tagore lived and died in an era of chauvinism and his thoughts as reflected in his writings were stunningly unbiased and objective”. It’s true and this reflects in Datta’s work as he keeps every single mood intact in these stories. Every reader of this book, will be able to catch the original magic of Tagore’s way of telling a story: his love of nature and human kind, philosophy, faith, experiences and insights into life and relationships. Datta’s meticulous effort turns the book into a treasured collection for book-lovers who definitely should dive into it. The book is printed by Pothi.com, India's answer to Amazon's Create Space.